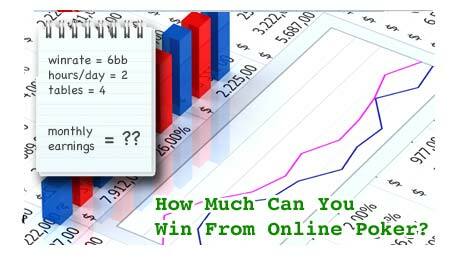 How Much Can You Win From Online Poker? How much money can you win from online poker exactly? As much as we might enjoy just playing the game, we all want to win money from online poker. That’s the ultimate goal. But as a winning player, how much is it possible to actually win from online poker? In this article I will take a look at the amount of money you can win from no limit Texas Hold’em cash games. If you're not a winning poker player yet, check out the Texas Hold'em strategy section and get learning. What affects how much you can win? There are four main variables that can increase of decrease how much you can win from one month to the next in NL cash games. Your winrate. Basically “how good you are” at playing poker. How often you play. The more you play, the more you can win. How many tables you multi-table. The more tables you play at the more hands you can get in to your sessions. More hands = more money. The stakes you play for. The more money there is at stake, the more you can win. With four big variables like this, you can’t put an exact figure on how much any given player can expect to win. But, what I can do is give an estimate of how much different player types could possibly win at varying stakes cash games. How much you can win from different stakes games? Let’s assume that at each of these levels, you are playing at 4 tables at a time and winning 6bb/hour from each table, which is a fairly conservative winrate. Maintaining this winrate will get more and more difficult as you move up the levels (and near impossible at the higher stakes games), but we’ll stick with it for the most part. Casual player = 0.5 hours a day. Semi regular player = 1 hour a day. Regular player = 2 hours a day. Grinder = 4 hours a day. $2NL - up to $57.50 a month. Semi regular = $14.4 /month. $5NL - up to $144 a month. Semi regular = $36 /month. $10NL - up to $288 a month. Semi regular = $72 /month. $25NL - up to $720 a month. Semi regular = $180 /month. $50NL - up to $1,440 a month. Semi regular = $360 /month. After $50NL it will become a lot trickier to maintain a 6bb/hour winrate across 4 tables. So, to keep things conservative, I will use a 4bb/hour winrate for the next set of stakes games. This is still whilst multi-tabling 4 tables at a time. $100NL - up to $1,920 a month. Semi regular = $480 /month. $200NL - up to $3,840 a month. Semi regular = $960 /month. $400NL - up to $7,680 a month. Semi regular = $1,920 /month. Above $400NL the games are going to get a lot tougher again. So, to keep things conservative I will reduce the number of tables down to 2. $1,000NL - up to $9,600 a month. Semi regular = $2,400 /month. $2,000NL - up to $12,000 a month. Semi regular = $4,800 /month. Above (and even at) these levels you are going to find it more difficult to keep a solid winrate and get steady amounts of action, so any estimates I could make at potential monthly earnings would be less accurate. Either way, there’s a ridiculous amount of money to be made. What stakes do you need to play to make a living from online poker? I wouldn’t want to play any lower than $100NL if I wanted to try and make a living from online poker, and even then things would be touch and go. $200NL would be more comfortable if you can maintain a steady winrate at that level. There are a lot of swings involved in poker, so just because you can win up to $2,000 a month grinding it out at $100NL, it doesn’t mean that that’s going to be a consistent income (thanks to downswings and variance). However, tips and advice on playing online poker professionally is a whole new subject in itself, so I’ll leave it at that for now. Either way, don’t jump head first in to thinking that you can give up your day job just because you can beat $100NL. Evaluation of winning money from online poker. All of the guidelines for potential monthly earnings are based on some pretty conservative mathematics. At the end of the day, if you’re a winning poker player, there’s a good amount of money to be won from the game. However, you have to remember that poker is never consistent, so you can expect to win X amount of money each and every month. Some months will be higher than expected and some could be much lower, but over the long run they should average out. If you work hard at your game and play hard, there’s no reason why online poker can’t produce a solid income for you.